hrough a dramatic stone-arched hallway are the living area and the kitchen. 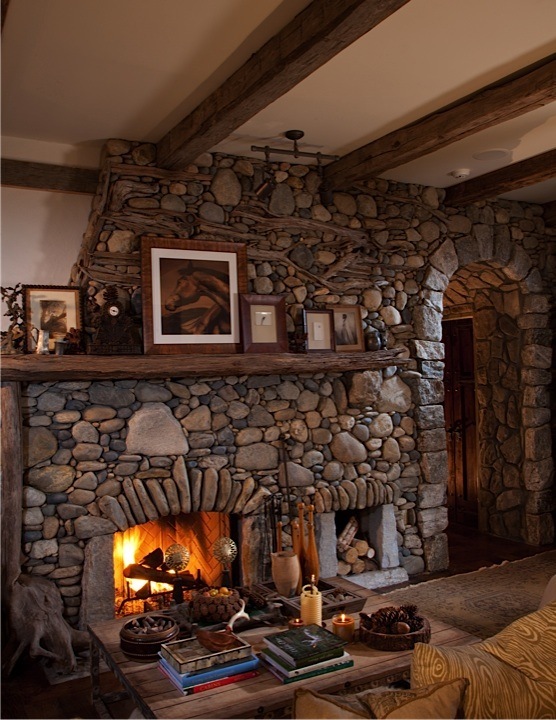 The magnificent stone fireplace stretches across almost one entire wall. The stones and branches are arranged to resemble a stone riverbed and were some were gathered from the property and the old house. This room is so welcoming and comfy that you may never want to leave–but keep touring with me. The kitchen is just beyond this room and is a feast for the eyes. The antique limestone floor is from France and adds an old-world feel to this very new kitchen. I love the old three-tiered shelf use as an island–great extra storage and added working space for the cook. 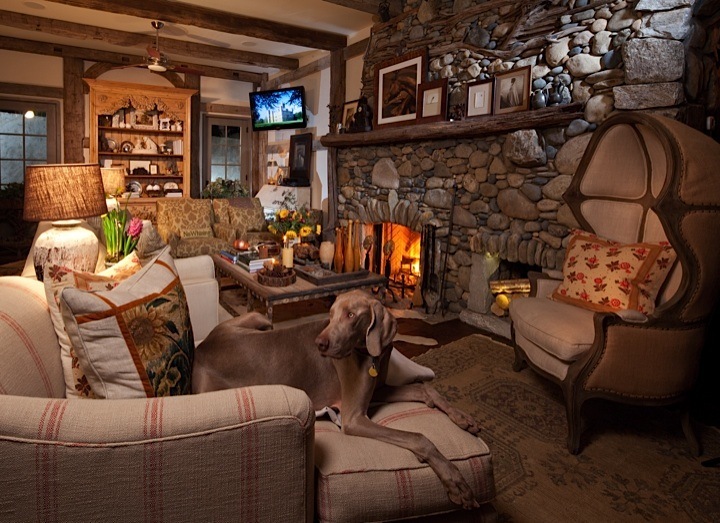 Warm and welcoming Great room–Sprocket loves it too! Just take a seat and smuggle in–love this space. The kitchen is on the right under the glass cabinets. 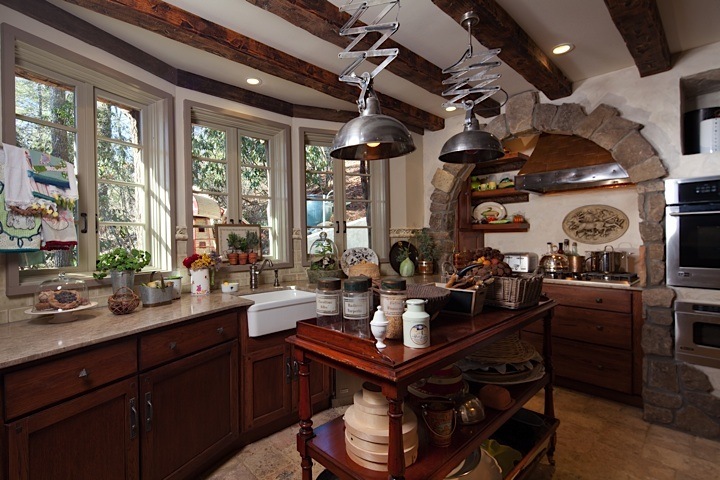 The kitchen features antique French limestone floors, old beams, a charming old island and industrial lighting–all my favorites! The bedroom tours start next … think you will love them. All photos by Lou Freeman and provided by Bill Cook–many, many thanks! 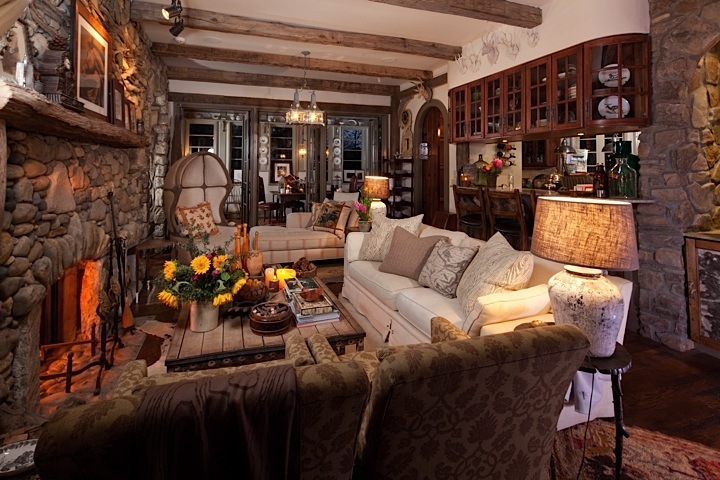 Read more about this lovely home in Atlanta Homes and Lifestyles. Cathy, It is even more amazing in person. This place is amazing! I am so enjoying the tour! I am glad you are enjoying the tour. You can see more in the November issue of Atlanta Homes & Lifestyles.